Leendert Van Bochoven, Global Lead, Defense & Intelligence, IBM Global Government and Donald Fenhagen, Partner, Department of Homeland Security, IBM Global Business Services contributed to this blog. The increasingly complex nature of threats around the world makes it imperative for governments to share information that can help them detect, protect, and respond with speed and efficiency. To that end, the IBM Center is releasing a new report, Integrating and Analyzing Data Across Governments: The Key to 21st Century Security, by Douglas Lute, former US Ambassador to NATO and now affiliated with Harvard’s Belfer Center for Science and International Affairs, and Francis Taylor, former DHS Undersecretary for Intelligence and Analysis and now affiliated with Notre Dame’s Keough School of Global Affairs. 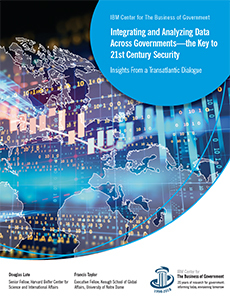 The report’s authors draw primarily on insights and recommendations from two roundtable discussions with current and former government leaders and stakeholders. The first meeting, held in Washington, D.C., in October 2017, focused on how DHS information sharing enterprise can have the greatest impact and interaction with partners. The second meeting, held at the U.S. Mission to the European Union (EU) in Brussels in March 2018, focused on how the European Union and other European organizations and member states can work with U.S. agencies to enhance outcomes from improved information sharing. The report finds that addressing these challenges will help DHS, the EU, and related stakeholders understand common operational needs and strengthen transatlantic information sharing and collaboration, especially in light of EU protections for privacy and data security. Other topics included how best to assist DHS and other stakeholders in using information to achieve strategic and mission outcomes, the expertise within government needed to develop and maintain solutions, and external linkages needed to ensure successful implementation. Analytics through a rules-based approach, instead of binary calculation. DHS has made progress in this arena. Industry partnerships. For example, the U.S. government has developed numerous public-private partnerships to address cyber information sharing. Information sharing across multilateral collaboratives, like the Schengen Area, which is the integrating factor across Europe. Schengen is a region of 26 European countries that do not require a passport or other controls to cross their borders. The process of developing and implementing the General Data Protection Regulation (GDPR) legislation and similar policies, which have enabled the EU to promote a much more robust debate about the relationship between government and citizens involving data protection. The U.S. and EU face similar challenges with interoperability and trust. DHS has been working with the EU on interoperability; the EU has taught DHS about the “once-only” policy, under which citizens must give information to government once, and then the government uses the information in a transparent manner. The EU has also made progress on information sharing between countries. Ultimately, trust underpins any information sharing. Given the complex environment in which the U.S. and EU operate, building trust must be dynamically negotiated and not a “binary” condition. Governments must be specific about the content to be shared, its handling, and its acceptable use. Trust is built by the successful exchange of information for a specific purpose, which requires specific content for an agreed upon time period.